Home » Health » What Is Diabetes Gestational? Gestational Diabetes is diabetes that appears during pregnancy and only lasts until the birth process. This condition can occur at any gestational age, but usually takes place in the 24th to 28th week of pregnancy. As with normal diabetes, gestational diabetes occurs when the body does not produce enough insulin to control glucose ( sugar ) levels in the blood during pregnancy. This condition can endanger the mother and child, but can be supressed if handled quickly and precisely. Please note that not all the symptoms above indicate gestational diabetes, because it can be experienced by pregnant women. Therefore, talk to your doctor if you experience the above conditions. Not yet known exactly what causes gestational diabetes. However, this condition is thought to be related to hormonal changes during pregnancy. During pregnancy, the placenta will produce more hormones, such as the hormone estrogen, HPL ( human placental lactogen ), including hormones that make the body immune to insulin, a hormone that lowers blood sugar levels. As a result, blood sugar levels increase and cause gestational diabetes. Have a history of high blood pressure (hypertension). Have had gestational diabetes in a previous pregnancy. Never give birth to a child weighing 4.5 kg or more. Have a history of diabetes in the family. Having PCOS ( polycystic ovary syndrome ) or taktosis nigrikans. Initial oral glucose tolerance test (TTGO). In the initial TTGO, the doctor will check the patient's blood sugar level, one hour before and after the sugar is given. If the initial TTGO results show blood sugar levels above 130-140 mg / dL, the doctor will carry out an advanced oral glucose tolerance test. Advanced oral glucose tolerance test (OGTT). On this test, patients will be asked to fast overnight before undergoing a blood test in the morning. After the first blood is taken, the doctor will give sugar water with a higher sugar content than the initial TTGO. Then, blood sugar levels will be checked 3 times every hour. If 2 out of 3 examinations show high blood sugar levels, patients will be diagnosed with gestational diabetes. 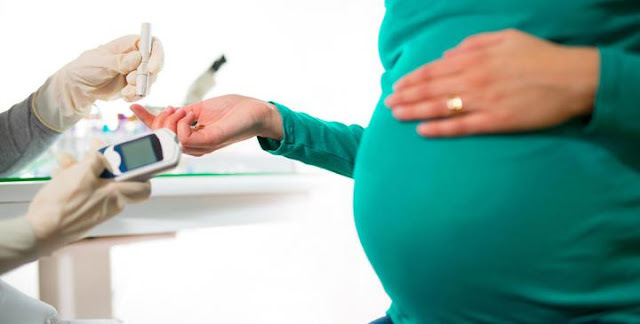 In patients who have been diagnosed with gestational diabetes, the doctor will recommend a more routine blood test, especially in the last 3 months of pregnancy. If pregnancy complications occur, the doctor will examine the patient's placental function to ensure the baby gets the right oxygen and nutrients in the uterus. The doctor will also re-run a blood test after the patient gives birth and after 6-12 weeks thereafter, to ensure the patient's blood sugar levels have returned to normal. Patients are also advised to undergo a blood test every 3 years, even though blood sugar levels have returned to normal. Routine blood sugar levels . The doctor will advise patients to check their blood 4-5 times a day, especially in the morning and after each meal. Patients can check their blood independently, use small needles, and put blood on the blood sugar check. Healthy diet. The doctor will advise patients to consume lots of high-fiber foods, such as fruits, vegetables, and whole grains. Patients are also advised to limit consumption of sweet foods, as well as foods with high fat and calorie content. Losing weight while pregnant is not recommended, because the body is in need of extra energy. Therefore, if you want to lose weight, do it before planning a pregnancy. Diet patterns are also not the same for each patient. Therefore, consult with your doctor about the diet pattern that is right for you. Sports. Exercise can stimulate the body to move sugar from the blood into cells to be converted into energy. Another benefit of regular exercise is that it helps reduce pregnancy discomfort, such as back pain, muscle cramps, swelling, constipation, and difficulty sleeping. Drugs. If a healthy diet and exercise have not been able to reduce blood sugar levels, your doctor will prescribe metformin . If metformin is not effective or causes severe side effects, the doctor will inject insulin. About 10-20 percent of gestational diabetes patients need medication to normalize blood sugar levels. If blood sugar levels in pregnant women remain uncontrolled or have not given birth at more than 40 weeks' gestation, doctors can choose to have a caesarean section or induction to speed up labor. Being overweight at birth is caused by high blood sugar levels ( macrosomia ) . Premature birth which results in a baby's respiratory distress syndrome . This condition can also occur in babies born on time. Born with low blood sugar ( hypoglycemia ) due to high insulin production. This condition can cause seizures in infants, but can be treated by giving them sugar intake. The risk of obesity and type 2 diabetes as adults. In addition to infants, pregnant women also have the potential to experience complications, such as hypertension and preeclampsia , which can endanger the lives of mothers and babies. Pregnant women are also at risk of developing gestational diabetes in their next pregnancy, or even getting type 2 diabetes. Increase consumption of high fiber foods, such as vegetables and fruits. In addition, avoid foods that contain high fat or calories. Exercise regularly to maintain body fitness before and during pregnancy. It is recommended to do moderate to moderate exercise, such as swimming, brisk walking, or cycling at least 30 minutes per day. If not possible, do a brief but periodic exercise, such as frequent walking or doing homework. Lower weight when planning a pregnancy by undergoing a healthy healthy eating pattern. This step will also provide long-term benefits, such as having a healthy heart. 0 Response to "What Is Diabetes Gestational?"